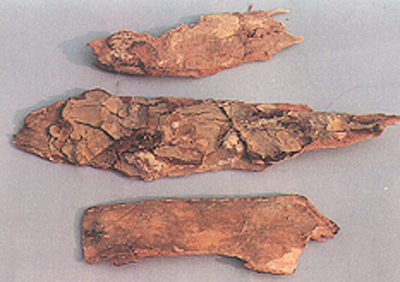 The root bark or peri-root bark of Pseudolarix kaempfri Gold. of family Pinaceae. Mainly in Jiangsu, Zhejiang and Anhui provinces of China. Exploited before or after summer solstice. Light smell, bitter and astringent taste. 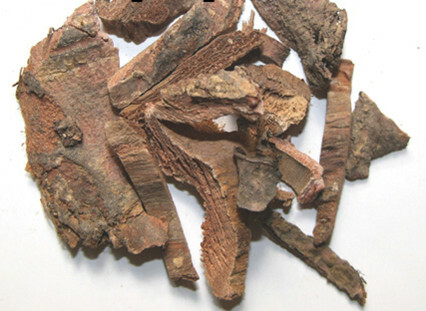 Large in size, yellowish brown in color, with cellulose and without cortex. Pungent, warm; toxic; lung and spleen meridians entered. It is toxic, so it can only be indicated externally. It is good at killing parasites, curing ringworm, expelling dampness and relieve itching, while the main action focuses on treating ringworm. It can be either singly used in wine or ground into powder to mix with vinegar for external application, or combined with ortho-oxybenzoic acid and benzoic acid to make into tincture for external application. For eczema and itching of skin, it can be used singly in wine for external application, or combined with dampness-astringing and itching-relieving herbs. For instance, it is combined with Ku Shen, Bai Fan and She Chuang Zi, etc. to be made into powder to mix with wine for external application. Take proper dose for external application. Soaked in vinegar or wine or ground into powder for external application. It should be used externally only, not for internal use.